A special display of Greeves scramblers – one for each year of the firm’s existence – is being planned for the Telford Classic Dirt Bike Show, sponsored by Hagon Shocks, at the Telford International Centre over the weekend of February 18/19. 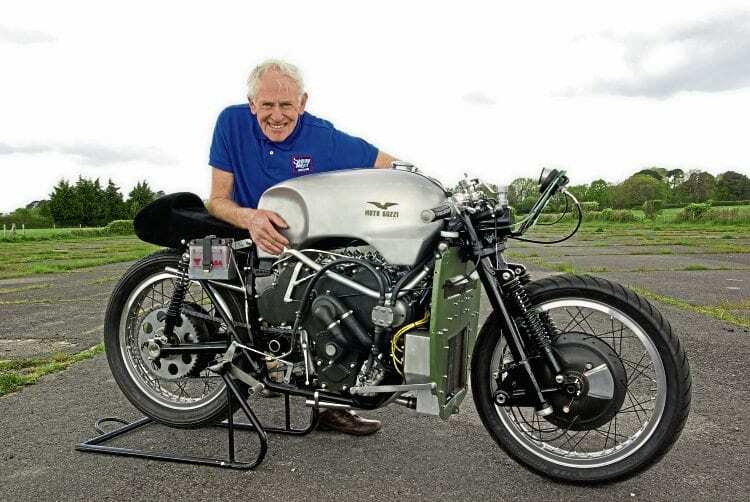 One of the finest trials riders the world has ever seen, Sammy Miller poses with one of the all-time masterpieces of motorcycle road racing design, the Guzzi V8 which will make an appearance at the Classic Dirt Bike Show. With the fully-enclosed fairing removed, the complexity of the 498cc machine Guzzi can really be appreciated. In a world first, no fewer than 21 scramblers, from the first production run in 1954 to the very last 1976 QUB Mk.2 380cc Griffon, should be on display at a Greeves club stand more than three times its normal size. Display secretary Dave Bradley, who can be contacted on 01777 870826, will be delighted to hear from the owners of any of these machines. The famous Essex company was formed after Bert Greeves, while mowing his extensive lawn, thought of a way to help give motorised movement to his disabled cousin Derry Preston Cobb, and after developing the idea the light blue 197cc Villiers-powered Invacar went into production. Thousands were built from 1952 until the mid-1960s at a small factory in Thundersley, Essex, and with a strong interest in trials, Bert was soon manufacturing trials, scrambling and road machines, followed by road racers, which together were built in their thousands.